I really enjoyed the lunar eclipse earlier this week, my gear worked without any errors and the skies were very clear. I'm almost 30 and this was the first time that I visually observed a lunar eclipse. The next one visible from Western Europe only occurs in 2029, so I'm glad that it all worked out this time. Looking through the eyepiece, I could easily observe both the illuminated and eclipsed parts of the Moon simultaneously. But the difference in brightness was actually huge (over 9 photographic stops) and it was impossible to capture the dynamic range of the entire scene with a single exposure. Nonetheless, I tried to recreate the visual appearance of the event by combining several different exposures into HDR images. Blending the layers involved quite a bit of artistic freedom, it's mostly my own memory of the event. The HDR images seem to have a bit more depth or 3D-effect due to the rounded shape of Earth's shadow. I quite like that, because the shadow was one of the first things that blew me away during the observation. That's a very well done series. Probably one of the better HDR treatments that I've seen. Thanks for sharing. I agree with James, one of the better HDR treatments. Well done! Really great work. Artistic freedom? Maybe. Artistic talent? Definitely! What they said. Thanks for sharing. Thanks for the compliments everyone. I'm always open for suggestions to improve my work, so feel free to critique. Is the look of these images similar to your own visual experience of the event? Congratulations!!!! This is a very beautiful series. Artistic freedom... Artistic talent... I would add Artistic Accuracy because it exactly looks like what I saw through the eyepiece. Well done ! Very much so! That is what is so remarkable about them. They are as close to the "real thing" as any images of a lunar eclipse that I have seen. 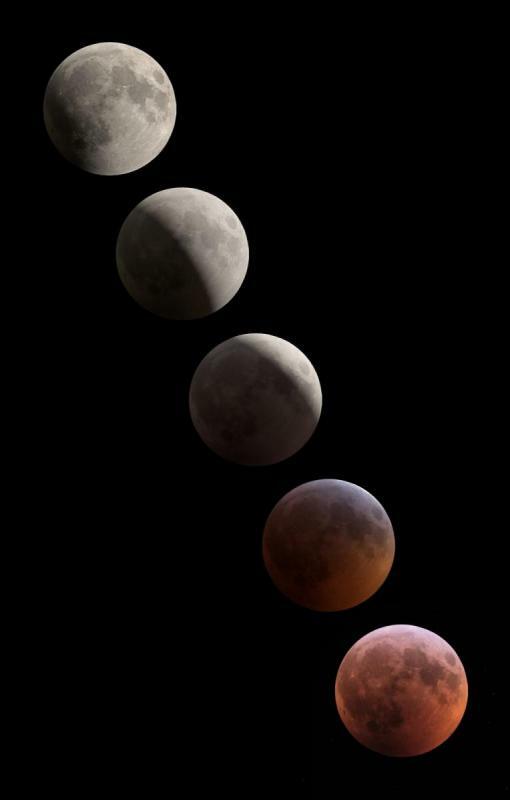 This is a beautiful sequence and what I hoped to accomplish myself with a series of exposures of the eclipse! Unfortunately I only took two sets of exposures (one long for the dim side and one short for the bright side), and I'm finding that blending the two sets is very challenging. Your sequence is an inspiration!